Call me old fashioned, but I was raised that if you break someone elses property, you fix what you broke, period. If it's something that looks shaky or is about to break, don't touch, tell them first, let them make the call. That said, this guy is just doing nothing but make it worse, I agree with babymog, get pictures and document dates and what happened, you WILL need that info, get the car out of there and to another mechanic, send him the bill, he will most likely fight you saying you didn't give him a chance to fix it as most of that type does, which is where those pics and documented damages with dates will prove him wrong, and that you were preventing further damages. Ultimately he is responsible to fix every bit of what he caused. Make sure you mention the shop on the forum in a warning thread for others to avoid. Last edited by Mustang_man298; 03-27-2008 at 11:11 PM. There's a tool that allows a broken tumbler to be quickly and easily extracted. The video quality is horrible, but you get the idea. ANY thoughts, help, or ideas are greatly appreciated! 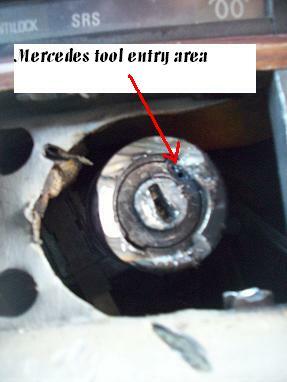 He said he needs a special Mercedes tool to continue, but is having trouble finding it. Can I buy one and normally how much? THANKS! OMG!!!!! THAT IS SO WRONG... On so many levels. Danger Will Robinson Danger... Run away..
How do you remove the ignition from this point. I watched it on the video speedy300Dturbo posted. It shows the point where I am at, but I don't understand what he's doing with his hand. It looks like he took the metal ring off, but how? He's going to finish as soon as he gets the MB ignition tool. Can you buy one anywhere local or just from MB? Thanks for replys, comments, or suggestions! Wow....I'd have run the guy over with the car by now. Now watch, when its all finally been fixed he'll find the keys in his work clothes or something. I just replaced the tumbler and key (both for under $100 from the dealer) because it was starting to get glitchy. Does your "ignition" key also work in your doors? Does the key work in the Driver Door, Passenger Door, and trunk? If so, then the odds of it being the ORIGNAL key are VERY high. Right? Sounds reasonable to me. Last edited by compress ignite; 03-28-2008 at 05:32 PM. 300+ seems a little high for a coded 126 tumbler- I've bought them in the past and granted at my emplyee discount but they were along the lines of $60-70 for me. Yeah I pay sub $100 for CORRECT VIN coded tumblers are under $30 for keys. If you're looking for the tool to stick in the hole and retract the lock-pin, most of us have had good luck with inserting the largest allen-wrench that will fit the hole, rotate and push in when you hit the pin to get it to retract, then the collar will un-screw and come off. Driving the s*** out of his 88 420 SEL! I'll get some footage of him doing some grinding tonight. Thank you for replys and comments!